How did I become an artist? You wouldn't believe it if I told you! I started out as a horse-crazy girl who wanted nothing else in life than to have a horse. I enjoyed drawing and doodling, but I was never very good at it. In fact, my high school art teacher once told me that I had absolutely no creativity whatsoever! I managed to get through art class with a C. What did it matter anyway? All I cared about were horses. I finally got my first horse when I was thirteen. 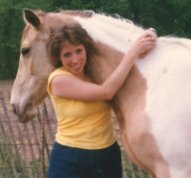 She was a buckskin and white pinto mare named Peaches N' Cream. I owned her until I was 29 years old. During those years I was busy working for many different horse stables. I started out working with Quarter Horses and in 1984 I was hired to go to Germany and train them for a stable that was importing them from America. I lived in Germany for a year and toward the end of my stay I went to a dressage and jumping school. I was hooked! When I came home, I took a working student job with a hunter/jumper trainer. Throughout the years I've worked as a groom, riding instructor, and trainer in jumping, dressage, and eventing. I got married in 1986, and now have 3 children. I found it very difficult to spend a lot of my time grooming and training horses, while raising three kids, and made a very painful decision to put horses aside. During those years I became depressed, and felt as if I'd lost my identity. It was in December 1994 that my artistic talent emerged. One evening I was paging through an event groom's handbook, kind of reminiscing, and saw a photograph of a thoroughbred that was captioned, "A well turned out eventer." 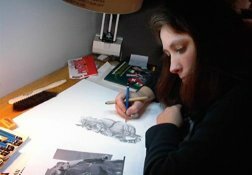 I started to see defined patterns, shapes, and tones, and thought, "I could draw that." I took out a piece of paper and that is exactly what I did. It turned out so well I had it framed. I thought it was a once in a life time event and was sure it would never happen again. I tried drawing a picture of Bill Shoemaker from a photograph in a book, and it turned out even better! Imagine my surprise! Later, a fellow artist explained that that evening was the night I found the right side of my brain. I didn't know I'd lost it! What happened after that? Go to my Art Gallery and see. As they say, the rest is history!